The city of Inglewood, California is helping to create a way for the NFL’s possible return to the Los Angeles area by demolishing of the grandstand at Hollywood Park racetrack. The site is for a proposed 80,000-seat NFL stadium. Hollywood Park originally opened on June 10, 1938. It was closed from 1942 to 1944 during World War II. Hollywood Park sits next to The Forum, once the home of the NBA Lakers, NHL Kings, NBA Clippers and WNBA Sparks. A rendering of St. Louis Rams’ owner Stan Kroenke’s proposed $1.86-billion venue at the former Hollywood Park racetrack site in Inglewood. 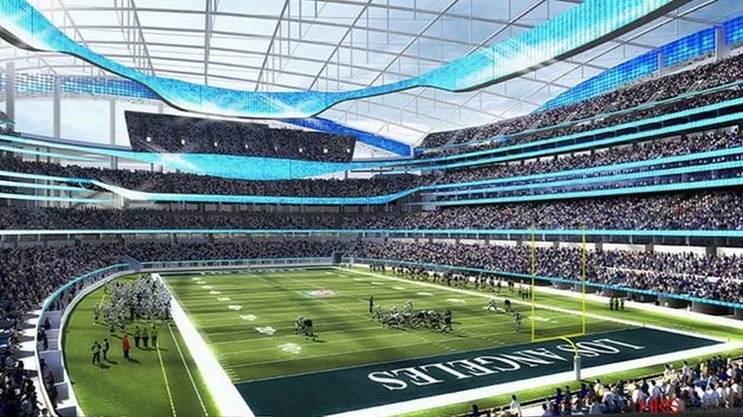 The NFL reportedly considers L.A. a two-team market and wants a stadium that could accommodate both teams. An NFL team has not played in L.A. since 1994.